A Theory of the Consumption Function. Princeton: Princeton University Press, 1957. First edition of Friedman’s magnum opus. Octavo, original cloth. Signed by Milton Friedman on the front free endpaper. Fine in a near fine dust jacket. Housed in a custom half morocco clamshell box. Rare and desirable signed. This economist's masterpiece of economic theory "reinterpreted that Keynesian concept of the consumption function by relating it to lifetime instead of current income. For its ingenious manipulation of data and its reconciliation of apparently conflicting evidence, this book must rank as one of the masterpiece of modern econometrics" (Blaug, 63). "Milton Friedman offered conservative answers to the great questions of economics, at the same time challenging economic thought since Keynes. In this book, Friedman disputes Keynes' idea that aggregate spending and income are directly linked (and therefore open to government influence). Rather, he writes, consumer spend independent of government policy, based on their expected long-term, or 'permanent' income. In all his writing, Friedman embraces a laissez-faire approach that celebrates individual freedom. He sees the ideal role for government as 'umpire', not 'parent' (NYPL Books of the Century 144). Chicago: The University of Chicago Press, 1998. First edition of this memoir by the Nobel Prize-winning economist and his wife Rose, a professor at the University of Chicago Law School. Octavo, original cloth, illustrated. 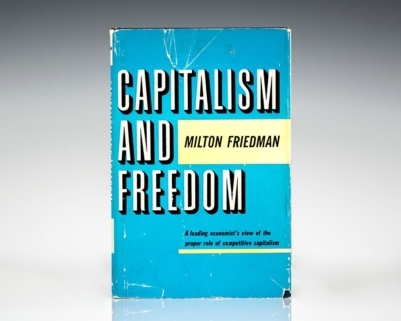 Presentation copy, inscribed by both authors on the half-title page, “For Vernon Paul Rose Friedman and signed below by Milton Friedman. Fine in a near fine price-clipped dust jacket. Money Mischief: Episodes in Monetary History. New York: Harcourt, Brace, Jovanovich Publishers, 1992. First edition of this work by the Nobel Prize-winning economist on monetary history. Octavo, original half cloth. Presentation copy, inscribed by the author, “For Alan, some bedtime reading, Best regards Milton.” Fine in a fine dust jacket. Housed in a custom half morocco clamshell box. 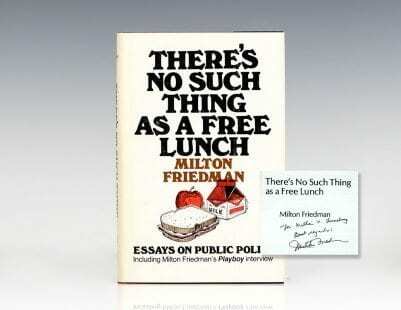 There’s No Such Thing As a Free Lunch: Essays On Public Policy. Chicago, Illinois: Open Court Publishing Company, 1975. First edition of a collection of key writings by Nobel Prize-winning economist Milton Friedman, “one of the 20th century’s leading economic scholars, on a par with giants like John Maynard Keynes and Paul Samuelson… [and] spiritual heir to Adam Smith” (New York Times). Octavo, original half cloth. Inscribed by the author on the title page, “For William V. Luneburg Best regards, Milton Friedman.” The recipient William Luneburg was the president of the American Motors Corporation and a friend of Friedman’s. He introduced the first subcompact car, the Gremlin, in 1970 to compete with energy-efficient small foreign cars. Fine in a near fine price-clipped dust jacket. Jacket design by Bud Edmondson. A nice association. First edition of a collection of key writings by Nobel Prize-winning economist Milton Friedman, “one of the 20th century’s leading economic scholars, on a par with giants like John Maynard Keynes and Paul Samuelson… [and] spiritual heir to Adam Smith” (New York Times). Octavo, original half cloth. Signed by Milton Friedman on the title page. Fine in a fine dust jacket. Jacket design by Bud Edmondson. Friedman, Milton & Anna Jacobson Schwartz. A Monetary History of the United States: 1867-1960. Princeton: Princeton University Press, 1963. First edition of this classic work. Octavo, original green cloth. Fine in a very good dust jacket. Signed by Milton Friedman Anna Jacobson Schwartz. Housed in a custom half morocco clamshell box. Friedman, Milton and Rose D.
Chicago: University of Chicago Press, 1998. First edition of this memoir by the Nobel Prize-winning economist and his wife Rose, a professor at the University of Chicago Law School. Octavo, original cloth, illustrated. Fine in near fine dust jacket. Warmly inscribed by both authors on the half-title page, “For Dorian + John with love and thanks for your friendship Milton + Rose.” Fine in a near fine dust jacket. Free to Choose Milton Friedman Japanese Woodblock Print Signed. Rare original Japanese woodblock print of a Japanese Zen Buddhist monk in contemplation bearing the title of American economist Milton Friedman’s classic work, Free to Choose. Signed by Friedman in the lower right corner of the image. The entire piece measures 21.5 inches by 15.5 inches. In fine condition. Rare and desirable. Tyranny of the Status Quo. New York: Harcourt Brace Jovanovich, 1984. First edition of this work which analyzes the Reagan Administration’s attempts to greatly reduce taxes, regulations, and government spending and suggests practical changes. Octavo, original half cloth. Signed by both Milton and Rose Friedman on the half-title page. Fine in a near fine dust jacket. Optimum Quantity of Money and Other Essays. First edition. Octavo, original half cloth. Signed by Milton Friedman on the title page. Fine in very good spine faded dust jacket. An important collection. Friedman, Milton & Simon Kuznets. Income From Independent Professional Practice. New York: National Bureau of Economic Research, 1945. 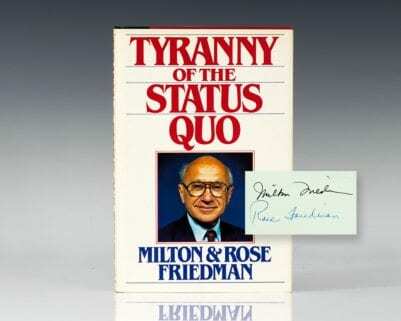 First edition of Milton Friedman’s first book, co-authored with fellow Nobel Prize-winning economist, Simon Kuznets. Octavo, original blue cloth, gilt titles to the spine. Signed by Milton Friedman on the title page. In near fine condition. Income From Independent Professional Practice served as his Ph.D. thesis at Columbia. Housed in a custom half morocco clamshell box. Rare, especially signed. 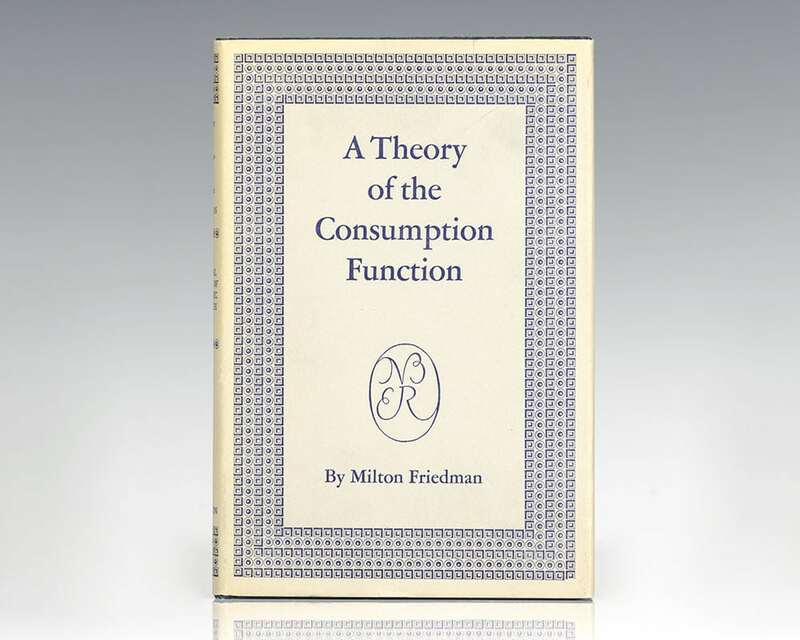 First edition, early printing of Friedmans’ persuasive argument for the free market, based on the PBS series Free to Choose. Octavo, original half cloth. 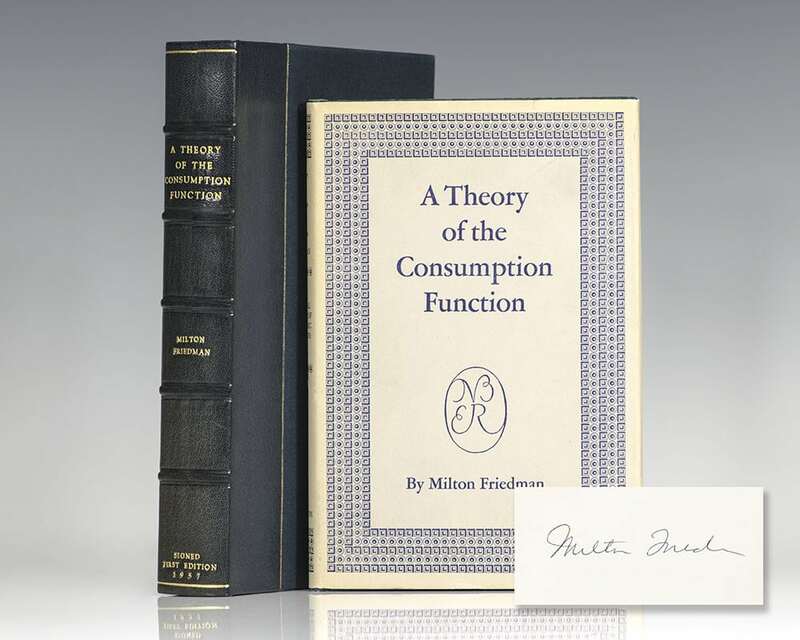 Presentation copy, inscribed by Milton Friedman on the half-title page to mathematician David Cox. Light rubbing, near fine in a near fine dust jacket. First edition of this memoir by the Nobel Prize-winning economist and his wife Rose, a professor at the University of Chicago Law School. Octavo, original cloth, illustrated. Inscribed by Milton Friedman on the half-title page, “For Kristin, more power to you, Milton Friedman.” Also signed by Rose Friedman below his signature. Fine in a fine dust jacket. Cambridge, MA: Blackwell Publishing, 1991. First edition. Octavo, original black cloth. Signed by Milton Friedman on the title page. Fine in a fine dust jacket. An important collection of writings. Housed in a custom half morocco clamshell box. Milton Friedman Autographed Letter Signed. Chicago: University of Chicago, 1976. Autograph letter signed by Milton Friedman to journalist John Chamberlain, dated March 19, 1976, just seven months before Friedman was awarded the Nobel Prize in Economics. The recipient John Chamberlain was a well-known journalist, business and economic historian, syndicated columnist and literary critic. A nice association linking these great twentieth century intellects. Matted and in a gilt frame. First edition of this memoir by the Nobel Prize-winning economist and his wife Rose, a professor at the University of Chicago Law School. Octavo, original cloth, illustrated. Boldly signed by both authors on the half-title page, Milton and Rose Friedman. Fine in a near fine dust jacket. Cover photograph by Steven N.S. Cheung. Milton Friedman Signed Nobel Lecture. Rare example of the Nobel Lecture of Milton Friedman, inscribed by the Nobel Prize-winning economist. 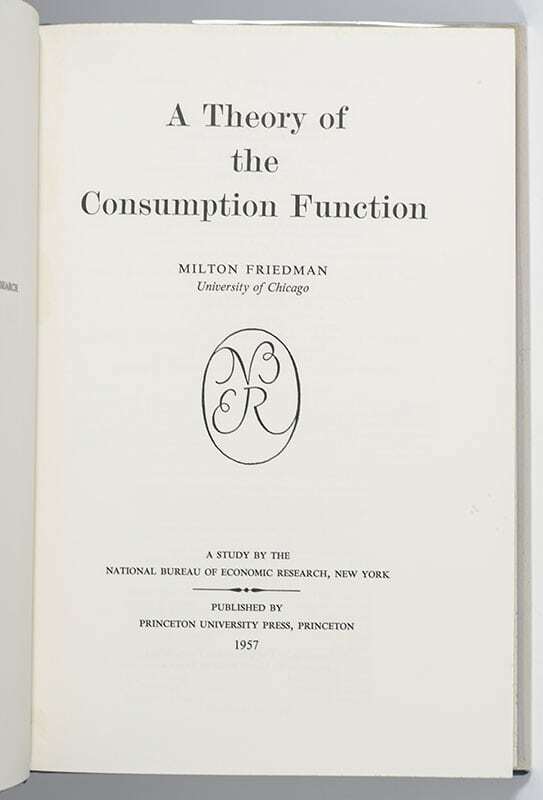 Four pages, stapled in the upper left corner, inscribed by Milton Friedman on the first page, “For Dan Dee Milton Friedman.” American economist Milton Friedman received the Nobel Memorial Prize in Economic Sciences in 1976 “for his achievements in the fields of consumption analysis, monetary history and theory and for his demonstration of the complexity of stabilization policy.” In fine condition. A nice example illustrating the progression of the great economist’s career in his own words. First edition. Octavo, original half cloth. Fine in a near fine dust jacket with a few small closed tears. 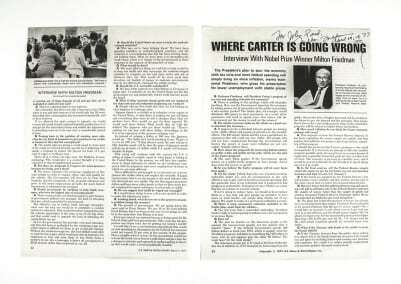 Where Carter is Going Wrong: Interview With Nobel Prize Winner Milton Friedman. New York: U.S. News and World Report, Inc, 1977. Magazine article from the March 7th 1977 issue of U.S. News & World Report transcribing an interview with Nobel prize-winning economist Milton Friedman. Inscribed by Friedman on the first page of the article, “For John Paul, Milton Friedman April 19, 1977.” Two pages. In near fine condition. Friedman, Milton; Introduction by Anna Jacobson Schwartz. First edition. Octavo, original cloth. Inscribed by the author on the half title page, “To the Jackson Hole economist Tucker Smith, Milton Friedman.” Fine in a fine dust jacket. Introduction by Anna J. Schwartz. Foreword by W. Glenn Campbell. Edited by Kurt R. Leube. Housed in a custom half morocco clamshell box. An important collection of the Nobel Prize-winning economist’s writings. Black and White Photograph of Nobel Prize-winning economist Milton Friedman. Inscribed and dated by Milton Friedman in 1980 on the lower right. In fine condition. Monetary Trends in the United States and the United Kingdom: Their Relation to Income, Prices, and Interest Rates, 1867 – 1975. Chicago: University of Chicago Press, 1982. First edition. Octavo, original cloth. Fine in near fine dust jacket. Friedman, Milton; With the Assistance of Rose Friedman. First edition of Friedman’s magnum opus. Octavo, original blue cloth. Fine in a very good dust jacket with some closed tears and a small piece of tape to the front panel. 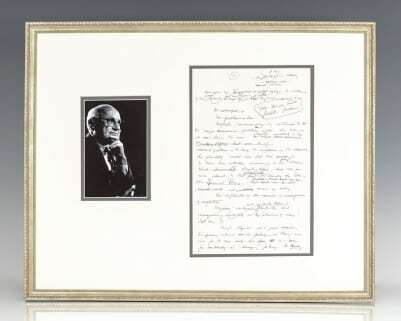 Milton Friedman Manuscript on J.M. Keynes’ The General Theory. One page signed and hand-corrected manuscript entirely in the hand of Nobel Prize-winning economist Milton Friedman discussing Keynes’ The General Theory. Inscribed in the top right corner, “For Mark Gruber, Milton Friedman”, the manuscript reads, “Inflation, not unemployment, continued to be the major economic problem after the war, as it was during the war. Keynes’…flexibility would have led him to turn his attention increasingly to the themes of Monetary Reform which were far more relevant to the post-war decades than those of The General Theory and remain so today…Though Keynes was a great thinker, his interest in theory was not for its own sake but ‘as a base’ for designing policy.” Several lines crossed out and corrected in Friedman’s hand. Double matted and framed with a photographic portrait of Friedman. The letter measures 7 inches by 11 inches. The entire piece measures 17.5 inches by 20.5 inches. An important piece linking two of the greatest rivaling economists of the twentieth century, with the former’s critique of the latter’s magnum opus. First edition of Friedmans’ persuasive argument for the free market, based on the PBS series Free to Choose. Octavo, original half cloth. Inscribed by the authors, “For Gordon St. Angelo, a fellow fighter in the good cause Milton Friedman.” Additionally signed and dated in the year of publication by Rose Friedman. The recipient Gordon St. Angelo helped create a foundation with Milton and Rose Friedman to promote and help establish educational choice in America. He served as President & CEO of the Milton and Rose D. Friedman Foundation for School Choice until 2009. Near fine a fine dust jacket. An exceptional association copy. First edition of Friedman’s magnum opus. Octavo, original blue cloth. Signed by Milton Friedman on the front free endpaper in a contemporary hand. Fine in a very good dust jacket with light rubbing. Housed in a custom half morocco clamshell box. Rare signed. Chicago: University of Chicago Press, 1953. First edition of the Nobel Prize-winning economist’s classic work. Octavo, original cloth. Signed by Milton Friedman on the front free endpaper. Light rubbing to the bottom cloth, near fine in a very good dust jacket with some light wear to the extremities and a chip to the crown of the spine. Housed in a custom half morocco clamshell box. Rare in the original dust jacket and signed. 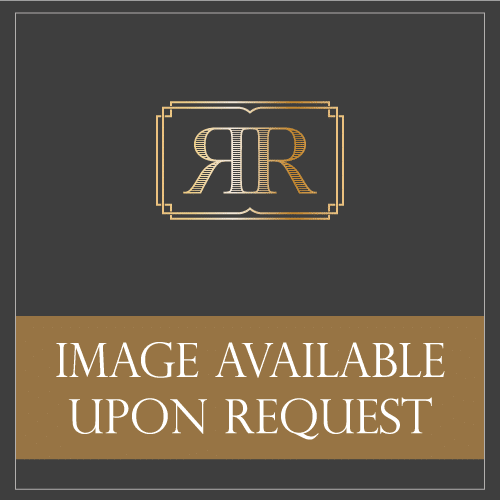 First edition of this work which analyzes the Reagan Administration’s attempts to greatly reduce taxes, regulations, and government spending and suggests practical changes. Octavo, original half cloth. Signed by both Milton Friedman and Rose Friedman on the front free endpaper. Fine in a near fine dust jacket with a slightly toned spine. Housed in a custom half morocco clamshell box. First edition of this work which analyzes the Reagan Administration’s attempts to greatly reduce taxes, regulations, and government spending and suggests practical changes. Octavo, original half cloth. Presentation copy, inscribed by the author on the front free endpaper, “For Proctor Jones with best wishes Milton Friedman.” Also signed by Rose Friedman. The recipient Proctor Jones was a San Francisco based filmmaker and author who in 1970 founded the Proctor Jones Publishing Company. Fine in a near fine dust jacket with a a few closed tears. First edition in the first-issue dust jacket of one of the scarcest and most desirable books in modern children’s literature. Oblong quarto, original cloth backed pictorial paper boards. Boldly inscribed by Maurice Sendak opposite the half-title page, “For Rachel GRR! Maurice Sendak” with a drawing of large growling Carol. Near fine in a near fine first-issue dust jacket. This is the correct first state of the dust jacket with no mention of the Caldecott award, and a $3.50 price at top of front flap. An exceptional example, rare and desirable with a drawing by Sendak. Eiger Dreams: Ventures Among Men And Mountains. New York: Lyons & Burford Publishers, 1990. First edition of Krakauer’s first book. Octavo, original half cloth. Presentation copy, inscribed by the author on the half-title page in the year of publication, “For Deborah- Stay loose, Climb hard! Congratulations on climbing Denali. You did better than I. Jon Krakauer October 1990. Near fine in a fine dust jacket. Jacket design by Paul Shaw. Jacket cover photograph by Jon Krakauer. Jacket back cover by Marc Twight. First edition of this collection of poems by the Pulitzer Prize-winning poet. Octavo, original boards. Signed by Mary Oliver on the title page. Gift inscription to the front free endpaper, very good in a near fine dust jacket. Jacket design by Bob Kosturko. New York: The Penguin Press, 2013. First deluxe edition of this collection of poems by Mary Oliver. Octavo, original cloth. Signed by Mary Oliver on the title page. Fine in the original slipcase, which is in fine condition. Illustrations by John Burgoyne.